AVID's latest CD traces the origins of one of the greatest and most long lived jazz bands in history...The Modern Jazz Quartet, and specifically it's legendary vibes player, the one and only Milt "Bags" Jackson. 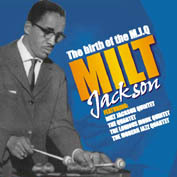 Originally the initials stood for "The Milt Jackson Quartet" but as our journey through the early history of the band, from recordings with jazz greats Thelonius Monk, Art Blakey, Sahib Shihab and Lou Donaldson will show, the influence of arranger, composer and director John Lewis began to tell on the band. The final eight tracks of this CD show us the final Savoy recordings of the Milt Jackson Quartet before the inevitable happened and they were formally incarnated into The Modern Jazz Quartet just before Christmas 1952. With only one replacement in 50 years, The MJQ were truly one of the great jazz bands and in Milt Jackson they had one of the very few great jazz vibes players. AVID's fine CD is a wonderful testament to the man who made it all happen.